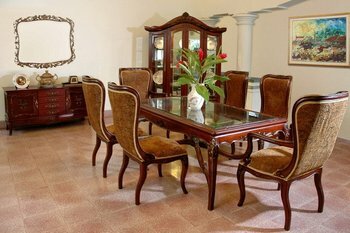 Harmony Dining Set consist of Table for 6 Chairs, 2 Arm Chairs, 4 Side Chairs, Gallery Cabinet, Sideboard, and Mirror. HARMONY Collection was created with genuine models and carving inspired by Renaissance era of XV century. The floral pattern carved by the expert and golden glaze final touch generate a magnificent masterpiece of Harmony. The collection cover up to all interior for Living Room Furniture, Dining Room Furniture, Bed Room Furniture, Bath Room Furniture, and Kitchen Room Furniture. This handmade and environmental friendly furniture dedicated for art lover who wishes to live in the symphony of ancient glory in modern atmosphere.